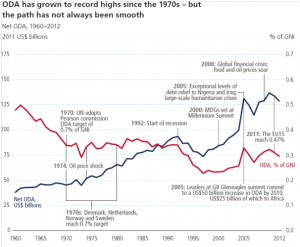 Although ODA provided by DAC donors has fallen from a peak of US$137 billion in 2010, it almost tripled in real terms (allowing for inflation) in the last 50 years, from around US$40 billion a year in the 1960s. Between 2000 and 2010 alone ODA increased 62%. Almost all donors have increased the levels of ODA given over the last decade. Six countries have more than doubled levels of ODA disbursements in that time: Australia, Finland, Ireland, Korea, the United States, and the United Kingdom. A further seven donors (Canada, France, Germany, Luxembourg, New Zealand, Sweden and Switzerland) have increased ODA by more than 60%. 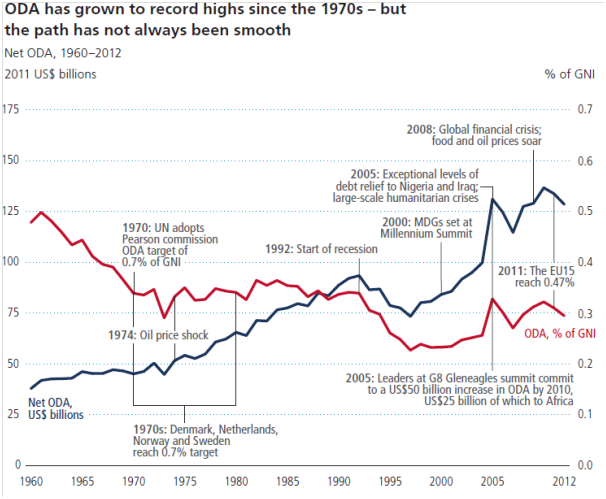 According to the OECD press release in April 2013, ODA “fell by 4% in real terms in 2012, following a 2% fall in 2011.” It attributed the reduction to the continuing financial crisis and euro zone turmoil which had “led several governments to tighten their budgets, which has had a direct impact on development aid.” Four of the five largest donors – the United States, the United Kingdom, France and Japan – saw ODA volumes fall between 2010 and 2012. ODA from Japan fell by 10% and France by 6%, although even larger falls in ODA were seen in other countries such as Spain (67%) and Greece (35%). The United States alone provides one quarter of DAC ODA, $30 billion in 2012, more than twice the next largest donor. Germany, the United Kingdom, France and Japan each provided more than $10 billion. These five are consistently the largest donors by volume only Germany among them did not reduce ODA levels between 2010 and 2012. The 15 largest donors account for 95% of ODA. However, although the US and Japan, in terms volume, provide significant amounts of ODA, they have low aid to GNI ratios (0.19% and 0.17% respectively) and also allocate smaller proportions of public expenditure to ODA. Meanwhile, the United Kingdom is expected to reach the 0.7% target in 2013 and in doing so will be the first G8 member to meet the pledge. The lines are blurred between ODA donor and recipient countries. Countries including Korea, which used to receive ODA, have now become significant donors. Indeed, according to 2012 OECD DAC data, the volume of ODA from Korea in 2012 surpassed that of Finland, Austria and Ireland after a threefold increase over the last decade. Several countries which are not DAC members also report ODA to the DAC. Moreover, 50 countries which are on the list of ODA recipients also provided aid to the UN Financial Tracking Service (a global database which records all reported international humanitarian aid) in 2011, while 125 countries have contributed to the UN Central Emergency Response Fund (a coordinated pool of funds for humanitarian action) since 2006, including ODA recipients Bangladesh, Ghana and Mozambique. Not only was sub-Saharan Africa the region that received most ODA in 2011 with 35% of net ODA, but twelve of the 20 largest aid recipient countries are in this region. About 17% of ODA is allocated to South and Central Asia, and Afghanistan was the largest overall recipient of ODA. 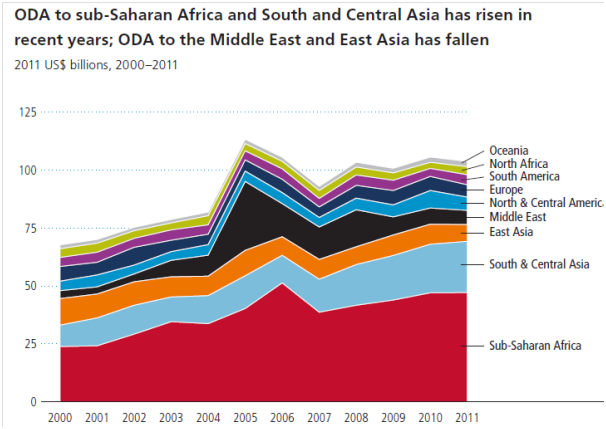 However, over the last decade the largest increases in ODA were seen in the Middle East. This growth was mainly driven by aid to Iraq which peaked at US$30 billion in 2005, although it has fallen back again since. The volume of ODA received has remained relatively constant in Oceania, North Africa, South America and Europe, while they have fallen slightly in East Asia. The Democratic Republic of Congo was the second largest single aid recipient, receiving almost 6% of total ODA. However, a small proportion is allocated to cross-border and regional initiatives (around 6% in 2011), and the remainder is not allocated to a specific region. The volume of ODA not allocated to a specific region has more than doubled over the decade. This aid consists of project-type interventions and core contributions to international NGOs, research institutions, multilateral organisations and pooled funds. Some ODA finances donors’ administrative costs, and for example costs of supporting refugees in donor countries. ODA allocated to regional initiatives includes support to the African regional communities, for example. After health, the sectors allocated most ODA resources are infrastructure and governance and security which both received 12%. The lowest share goes to agriculture. Although the environmental and water and sanitation sectors grew quickly in terms of ODA funding (213% and 138%), these two remained the smallest aid sectors accounting for only 3% and 4% respectively. Overall, agriculture receives the lowest amount of ODA. Regional variations in ODA allocation by sector are significant. 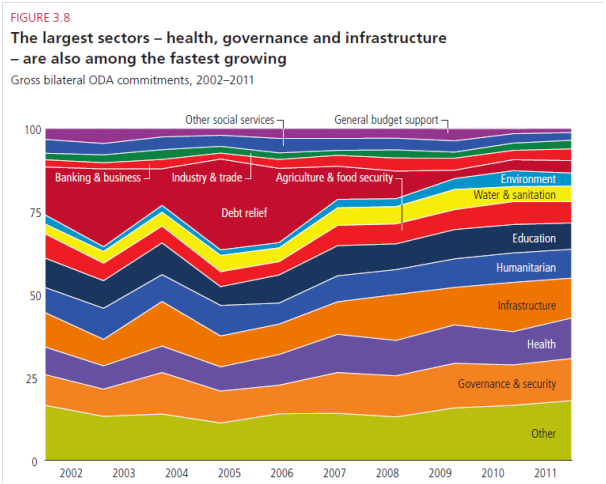 For example, in Sub-Saharan the share of ODA to health is twice that of governance and security, while governance and security is the largest sector in the Middle East. The United States is the largest bilateral donor to health, disbursing more than US$7 billion in 2011, 23% of its bilateral aid. The United Kingdom was the second largest bilateral donor to health, contributing more than US$1.5 billion in 2011, 12% of its bilateral aid. France and Germany provide the most education ODA, although International Development Association (IDA), the United Kingdom and Japan were also substantial donors to the sector. Japan contributed more than US$1 billion to agriculture and food security in 2011, the same as EU Institutions and IDA, but the United States contributed US$2.2 billion in that year. 13% is channeled through NGOs and 9% through organisations such as universities and think tanks. Around 40% of ODA is channeled through projects controlled by donors or allocated to the public sector in recipient countries. Another 40% is channeled through multilateral agencies, around one-third of which is earmarked for a specific purpose, project or country with the rest considered as core contributions. 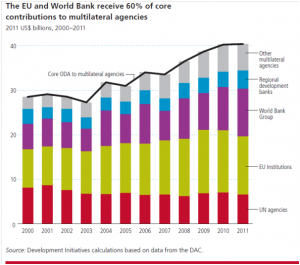 UN agencies and EU Institutions are the largest multilateral recipients of ODA, although the IDA (part of the World Bank Group) accounts for almost 16% (US$8 billion) of all core and earmarked contributions. The pattern of disbursements to multilateral agencies though differs substantially across institutions. Almost all ODA to EU institutions are core contributions from EU member states, whereas three-fifths of contributions to EU agencies are earmarked for a specific purpose or place. 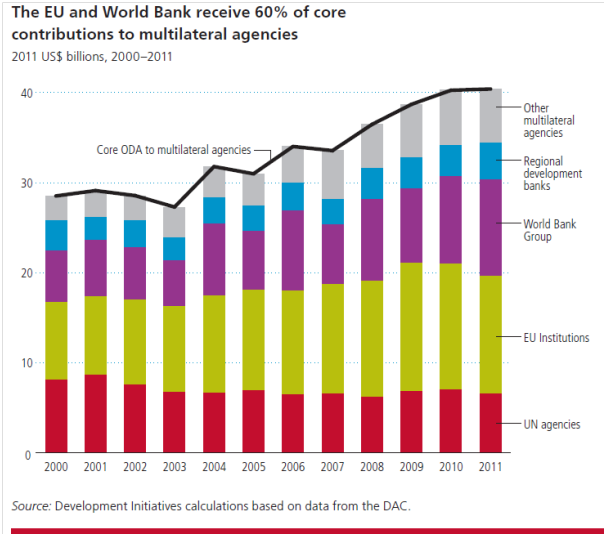 Between 2000 and 2011, contributions to multilateral agencies grew substantially. The growth of domestic resources and the expansion of other international resource flows – quintupled over the past 20 years – mean that ODA accounts for a decreasing share of the total resources available for promoting development and ending poverty. However, it is one international resource that can be targeted at poverty eradication. ODA also continues to be of significance to some of the poorest people and countries: it is the largest international resource flow for 43 countries, which are home to 250 million people living in extreme poverty. However, ODA needs to be considered within the wider range of financing instruments and resources. . This much wider group of providers includes official country donors, private organisations, corporations, philanthropists, as well as international and national NGOs. While ODA and the architecture around it is evolving, ODA remains a vital resource flow for countries where there is market failure or where government services are inadequate.